This is a very popular and very easy casual ride in a very scenic setting. It's a flat ride that extends along the entire coastline of Half Moon Bay. Other than sweeping views of the coast, the ocean, and picturesque bluffs, one thing that potentially sets this route apart from other such family-grade recreational trails is that a sizable segment of the ride takes place on an unpaved trail. Not only that, but limited segments of this dirt portion of the route is not far from what could be considered singletrack, as I've reflected in the ride's trail type breakdown. Formally, Half Moon Bay Coastside Trail, which makes up most if not all of this ride, is part of Half Moon Bay State Beach. Those interested in hitting Google for more information about the trail may like to know that it's just as commonly referred to as the "Half Moon Bay Coastal Trail". Part of the ambiguity in the naming might be arising from the fact that this trail is part of the California Coastal Trail. The suggested parking spot pointed out at the link on your left is a parking lot of Pillar Point Harbor. The signs at the parking lot are not exactly crystal-clear about this (because they mainly focus on RVs and boaters in the rules they spell out) but I believe parking in at least "Lot C" is free for day use. I haven't gotten into any trouble for doing this the couple of times I've done the ride. But, don't blame me if you're fined for parking there when you take my word for it without verifying the parking status for yourself. The beginning of Half Moon Bay Coastside Trail is near the boat ramp that's a few yards down the driveway from the parking lot. Nominally, the trail continues a little further up as well from where this ride starts, reaching up to Pillar Point. However, it stops being a trail and merely becomes a "designated route" following public streets for much of the distance on the way there. On this ride, I've included only the "trail" portion of the trail. Other than about a quarter mile along a sleepy beachfront street, this ride is completely removed from traffic. Most of the interaction you have with car traffic will be as you're crossing the driveways that access some beaches and campgrounds. On the other hand, there are quite a few of these and a few are even fairly busy. Going by the labels on the map, there are something like 11 named beaches along the length of this ride. In practice, though, it's mostly one, long, unbroken beach. The ride starts out following right behind the beach, almost at sea level, but soon ends up a couple of dozen feet higher and following along the edges of the coastal bluffs. These treeless expanses make the ride very scenic. At the same time, these coastal bluffs are subject to very rapid erosion and, a lot of times, this route passes mere feet away from the edge of a bluff or from small gullies cut into these bluffs. For that reason, you could say that the precise course of the trail is in a state of flux. There are numerous spots along the ride where the signs are clear of recent re-routing due to slides and collapses. So, don't expect your ride to follow precisely the route of the GPS track on this page even if you do the ride only a season or two after I write this. In addition, along the unpaved segment of the ride, you'll often have multiple parallel paths to pick from. Typically, you'll find one path following just a few feet from the edge of the bluff, one path weaving in and out around each gully but at a safer distance from the edge, and sometimes an even straighter dirt path further inside that continues like a bypass freeway. So, you'll be able to pick the path that fits your own comfort level the best. When speaking about Half Moon Bay, I'd be remiss if I didn't add a caveat about the climate. This won't be news to any locals of the area, but these parts of the Pacific coast are somewhat notorious for how often the weather can be cloudy, foggy, and chilly, regardless of how sunny and balmy the rest of the Bay Area is at that moment. Paradoxically, some of the cloudiest times of the area are during the warmest months of the summer. So, catching a day with good weather for the ride will be a tricky proposition. I don't have any foolproof advice in terms of weather. The best I can do is to tell you that the highest percentage of clear days in this area can be found in the late fall, but even then there are no guarantees. If the wide-open scenery and the refreshing ocean air are not enough to entice you, the only noteworthy point of interest I can call out along the ride is The Ritz-Carlton. The trail passes right through the property of this posh hotel and continues part of the way along its adjacent golf course. The novelty is bound to wear off after the first couple of times you do the ride, but, if you're not ordinarily among the regular clientele of resorts of this caliber, it could be interesting to be able to take an up-close look. This ride turns around from a clearly marked spot by the golf course where the designated public trail ends. If you're interested in extending this ride, the natural thing to do would be to continue further north along California Coastal Trail toward Montara. This will allow you to string together several more disjointed segments of coastal paved and unpaved trails via some quiet streets. 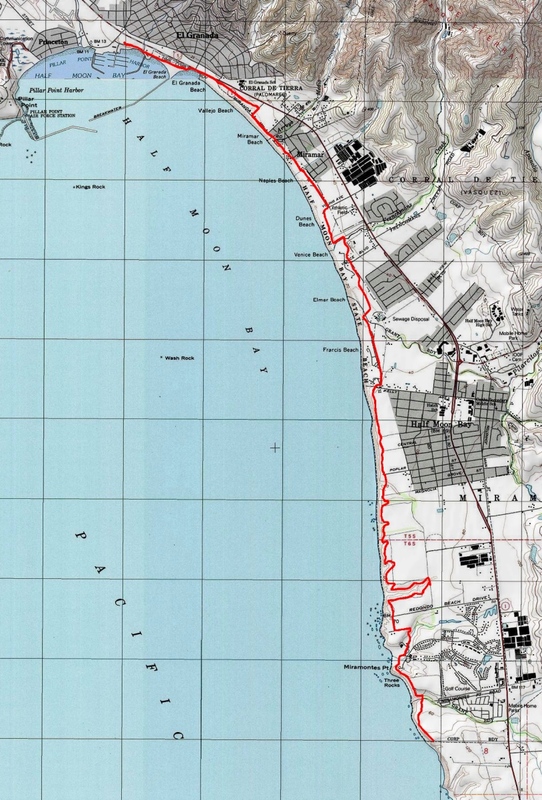 Continuing further south past the Ritz-Carlton should also be a possibility, but I say "should" because California Coastal Trail follows public roads between there and San Gregorio Beach (about 10 miles). Those who are interested in continuing south anyway will also want to know that you cannot continue directly past the turn-around point of this particular ride. You'll need to turn away from the route just before the last footbridge crossed on the ride and reach the trailhead on Miramontes Point Road instead.